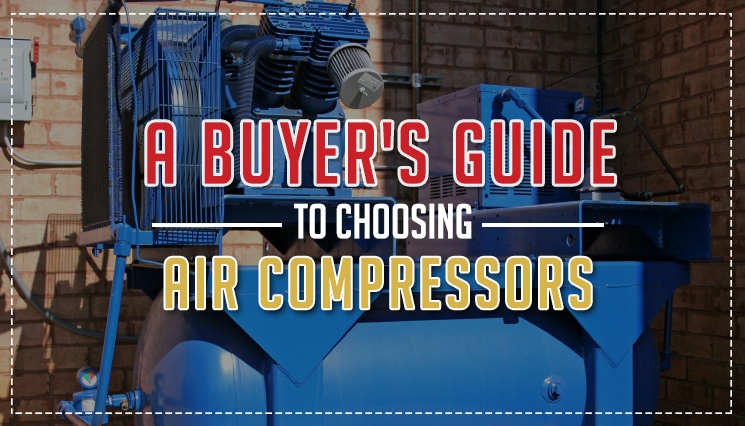 A Buyer's Guide to Choosing Air Compressors | Compresstech Resources, Inc. When buying air compressors, you’ll be presented with a lot of options and it would really be easy to get lost, if you have no idea on what to look for. To end your confusion, here’s a buying guide that will help facilitate a smooth and straightforward transaction. Understand your requirements. First of all, you have to know the type of equipment that you’ll use the air compressor for. Certainly, powering pneumatic tools has different requirements than inflating a tire or air brushing. Know the types of air compressors. There are two types of air compressors generally used in the industry. The reciprocating piston type which comes with a cylinder, piston and a one-way valve; and the rotary screw type which is designed for nonstop use and usually intended for industrial applications. Finding the right air compressor will depend on the factors that will determine what’s suited to your needs, as well as what can spare you from unnecessary cost and waste of time in the long run. To guide you further, enumerated below are the points that you need to take into consideration when buying air compressors. Air compressors should be able to supply sufficient air flow at the right flow to enable proper functioning of air tools. Basically, you have to refer to the user manual or consult a manufacturer to know the air consumption required by the air tools that you’ll be using. Aside from airflow requirement, the quality and volume of air that a compressor delivers also affect the operation of air tools. It is therefore important to ensure that the compressor you’ll choose will be able to deliver pressurised air according to what a tool requires. Please also note that excess in high pressure can also cause damages particularly in tools are designed to handle a specific pressure. How you plan to use your air tools is another important factor to keep in mind when buying air compressors. Remember that the tool’s air volume requirement changes depending on your usage. Basically, continuous use would demand greater air volume for optimal functioning than tasks that only require intermittent and short bursts. The pressure cycle and duty cycle of the air compressor affects optimal functioning as well as its operational life. Where you plan to use your air tools and your compressor is another main consideration when buying. There are portable compressors that will allow you to move your unit with ease and there are compressors that come with sizable tanks which affect portability. Should you choose portable compressors, you’ll have to deal with limited size, power and volume of air. On the other hand, bulky units that may not allow portability but are designed to sustain long periods of usage. Compresstech, a recognized industry leader that is committed in providing only high quality air compressors presents a wide range of options to meet whatever your needs and specifications are. This compressor is oil-free and oil-flooded screw compressor offers time-proven 2-stage & Single-Stage Compression Module & Rotors, as well as web-enabled controls intended for simple and hassle-free system monitoring. Available with fixed Speed or Variable Speed Drives, as well as instant monitoring and control. Gardner Denver offers a dependable air compressor that provides the power you need while ensuring cost-efficient and reliable operations. Scroll Compressor -This is a type of air compressor that enables energy efficiency and quiet operations. It also includes patents that are integrated in one design. Screw Compressor – Using Japanese technology, this air compressor operates with minimal noise. It also has an environment-friendly design that contributes to energy efficiency and low maintenance cost. Even with a wide range of options available, you can end the confusion in choosing the types and models of air compressors that will work best for you especially with the right considerations in mind. Visit our website for all your air compressor requirements. Want to find more information about air compressors? Regularly visit our blog to never miss a post.